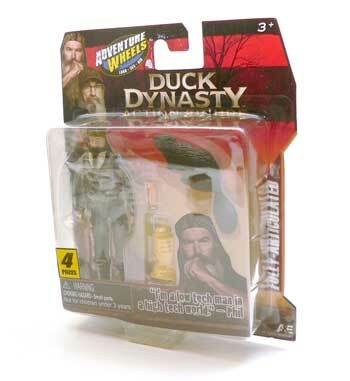 Well, I’m sure if you read the other Duck Dynasty figure reviews, you saw this coming. 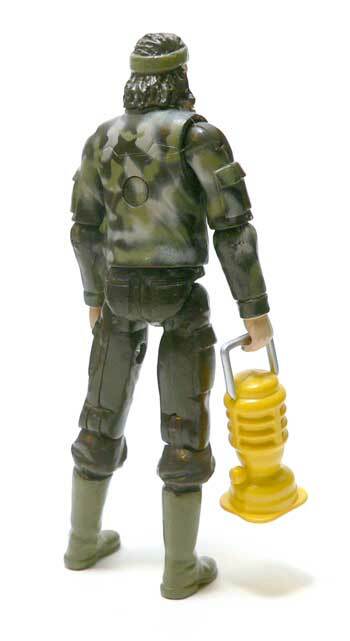 Phil is the fourth figure in the series and really one of the essential ones. Especially, if you consider he’s the one that founded Duck Commander. Phil’s appearance is much more like Uncle Si’s. On the show, Phil rarely leaves the wooded area around the house unless he’s sampling Miss Kay’s cooking. As such, he’s normally dressed for outdoors adventures and work. 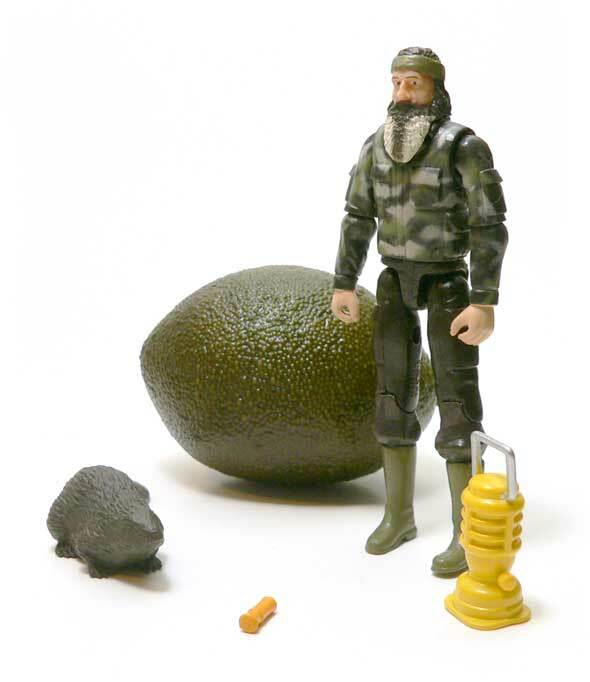 Essentially, the body of this figure is a repaint of Uncle Si. Since, these guys are dressed in generic hunting attire, I don’t really see this as a problem. Phil may be slightly taller in real life, but I’m willing to forgive that. Phil’s decked out in a camo jacket. I have to say that even though it’s the same undefined camo as Si’s, I like it a little better here. The colors they picked this time say more “woods” to me than Si’s, which looks more like urban camo. The biggest difference is the legs. Instead of full body camo, Phil has plain pants and boots. This really improves his look over Si. The color used for the boots looks perfect for a pair of rubber boots to go traipsing through the swamp in. 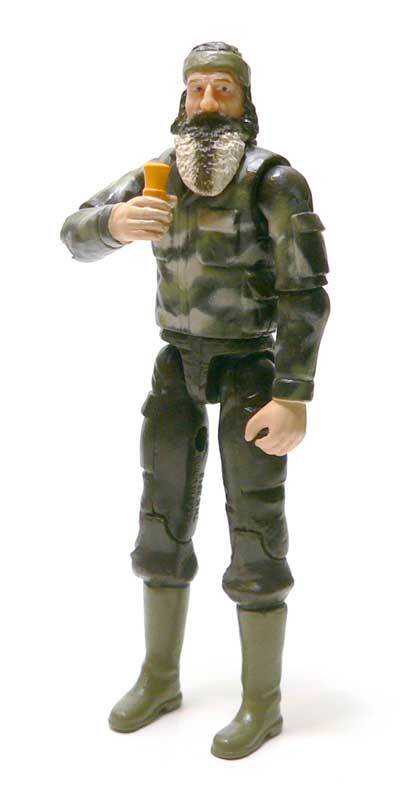 As with the other figures, the head is the part that sells this as Phil. And again, the underlying sculpt here is pretty good. Phil has a long, thin face and I think this head captures that. Similar to Willie, Phil is wearing his trademark bandanna in a solid color. Since, Phil’s is typically camo, the solid green doesn’t seem as much out of place as Willie’s. I’m a little unsure how I feel about the beard. Phil does have the striped effect going on in his beard. Honestly, I think I’ve seen pictures that look pretty close to the way it’s shown here. However, in more recent episodes of the show, Phil’s beard seems to be more all grey. I will say the joints on Phil feel better than any of the other figures I’ve gotten in this line. The hips are mabe a tad looser than I would like, but not horrible. The ratcheting elbows work better here, for sure. The waist joint is the only one that really feels poorly made here. Just like the rest of the line, Phil comes pretty well kitted out with three accessories. The first of which is the common, but necessary one that started it all, the duck call. Nothing new here, same orange color. The second item is a yellow camp style lantern. I’ve always thought of these as green, but that might be a trademark thing. It’s not the best accessory, but it’s serviceable. Similar to Willie’s cooler, the handle is molded in position. A higher cost figure might have had this piece cast is clear material and painted. Hmmm. That’s an idea for another day. 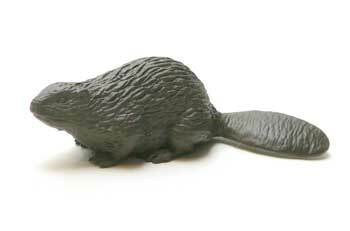 The last piece that Phil comes with is his nemesis, the beaver. Phil explains that he hates beavers for building dams and flooding land in an episode. Thus, it seems like a perfect accessory. Actually, out of all the animal accessories, this one might be the best. The scale is pretty good and the sculpt and color aren’t bad. Even the undercarriage has fur and isn’t just smooth. A little wash or articulated tail would be nice, but don’t make or break it. I’m a bit sad to get to the end of these four figures for review. Honestly, I’ve had as much taking pictures and posing them as some figures I’ve paid a lot more for. Considering the Marvel and Star Wars figures on the shelf for the same price point, I’d give the edge to the Duck Commander family. The more of these I’ve opened the more I’ve liked them. Phil is no exception. He just makes me Happy, Happy Happy. Sure, I’d love to have his camo recliner. But really I don’t have any major complaints. I’m really hoping as hard as these have been to find, that we see a second series of them. 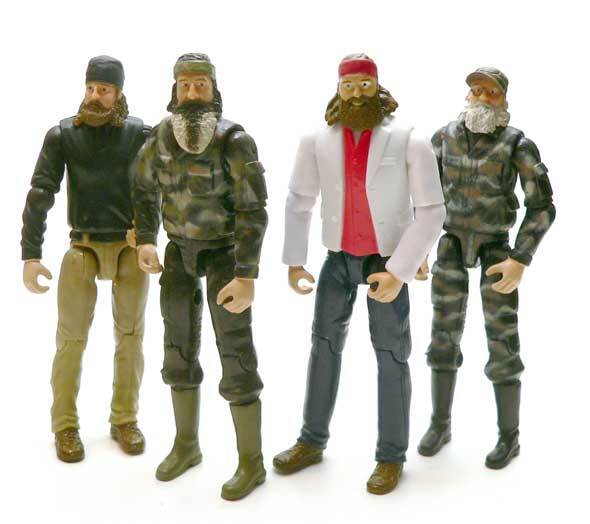 I’d kind of like them to invert what we saw with these four figures and have Willie and Jase in camo hunting gear and Si and Phil more casual. Phil in a t-shirt with camo pants would be perfect.